After visiting Pardubice, Prague was quite a different story. The city didn't feature any decent concentration of Cycle Chic. The poster, above, for a new Czech film - Protektor - was the best the Czech capital could come up with. 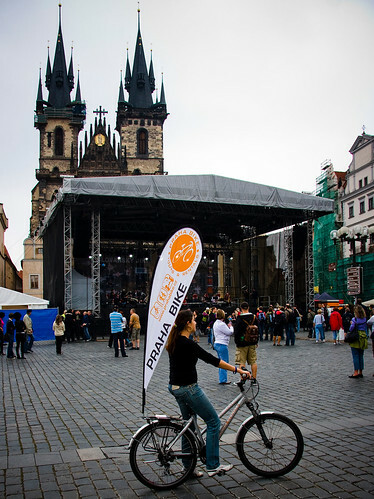 And this girl advertising Praha Bikes - bike rental. In fact, I think I only saw 30-40 cyclists the entire time I was there. But we're working on it. :-) I'm in Budapest as I write this and it's quite a different story. Many cyclists on the streets. More on that later. The poster is quite cool. I remember not seeing many cyclists in Czech Republic and Slovakia earlier this year. Have fun at the Critical Mass in Budapest today! I love Budapest! Have a blast! Egesegedre! Well I'm a Prague citizen and I need to say that they are prefered cars before bikes and public transport. On the other way the people are so mad that they comming every day to 20-60 min waiting in traffic jams crossing the city center! to just show that they are somebody ... they have a car. Even more the streets are full of these aggressive drivers so it's really dangerous to go by bike with them (the law did not cover the bikers when crash). My daily commute is about 20km one way from suburb and it takes 55min by bike, 60min by public transport and 90min by car. Sad, but whole Eastern Europe have to state its` bicycle rights. As a citizen of Russia, I can understand Mech1. This is true. People prefer cars in order to show smth, that they have reached some level... What level? Or the level of what? I do not know... We face the same in Sevastopol. But we ride and people can see bicycles every day. Same as mech1 and Denis here...having a car is having a "superior" status...many times "superior" because you take a LOT more time going from A to B in a car instead public transportation/walking/bike. The situation in Prague is sad. Our municipality is building the longest car tunel inside town center in all Europe and doesn't have time for much anything else. Mikkael, sorry we couldn't meet you. We were totally overhelmed by preparations for this public space festival/experiment. In Prague there is not necessary to drive a bike because there is dense and reliable network of public transportation. The second thing is Prague is hilly so riding a bicycle is not such relax as in Amsterdam or Copenhagen and unfortunately it is quite impossible to ride a bicycle for example to work or school and don't smell then... Blocking of important roads and motorways by demonstrative massive bicycle rides could make nothing with this essential fact. yes, too bad i missed you, hynek, but i had a great meeting with michal! regarding hills... sure, if you want to go to prague castle, it's uphill, but all over prague 1, 2 and 3 is brilliant. it's the perfect city for creating a bicycle paradise. Im form Prague and the situation really is bad. But on the other hand, people are feeling it and they are trying to change it. Every year there is a critical mass bike ride through prague..you missed it by two days! It is almost impossible for bikers to get around Prague so thats why so many people choose to ride public transports. I think it is also due to the terrain wich is very hilly in Prague. It's strange if you see the surveys, people who don't cycle in Prague think hills are very important, but people who do cycle, they do not regard hills as very important. It's more an imaginary obstacle than a real one. Doesn't make sense, does it? Quite a few bike messengers in Prague, however. Fully geared. Flat bars. Like they expect to approach a mountain on the banks of the Moldau. I live in Prague and the situation with cycling here *is* pretty bad, but it is getting better quickly. The main problem is educating drivers on how to share the road, but the infrastructure is developing well. The city is putting in a huge new tunnel for cars, but the surface development above it includes (at least according to the plans) a lot of bike lanes, lights, and other infrastructure that didn't exist there before. The city is also converting old rail lines to cycling use at a fairly good rate. They won't get rid of the hills or the icy/windy weather, but we can cope with that! Of course, Prague is a small city and once you get out of town, the cycling in the villages and quiet rural roads is spectacular. Thanks for your help in developing urban cycling here. I'm pretty sure we can get there and it won't take that long!